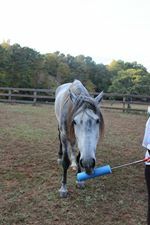 How scary is rehabbing and restarting a horse considered ‘damaged’ by most? And doing so while learning new skills and techniques? And on a new path? And with autonomy and liberty?? As I ventured into this new world of +R (positive reinforcement) and began learning to use a clicker, I realized this journey for Rhett and I would be more like ‘therapy sessions’ than training sessions. “Therapeutic” relates to the ‘treatment of dis-ease or disorders by remedial agents or methods.’ It has a beneficial effect on the body or mind. It produces a useful or favorable result or effect. Many thought clicker training was just for teaching tricks, but for Rhett, it was truly therapeutic. It only made sense that Rhett and I began to ‘feel’ and call our interactions ‘Clicker Therapy’. It became our new path, journey and language. 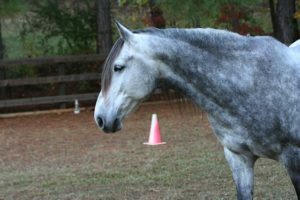 ‘Clicker Therapy’ could be used to decrease the amount of time it takes to teach your horse a new behavior. ‘Clicker Therapy’ could be used to overcome behavior problems – such as fear and anxiety based problems. 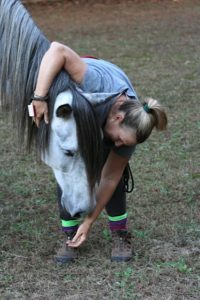 ‘Clicker Therapy’ could be used to change an association your horse has with something from negative to positive. 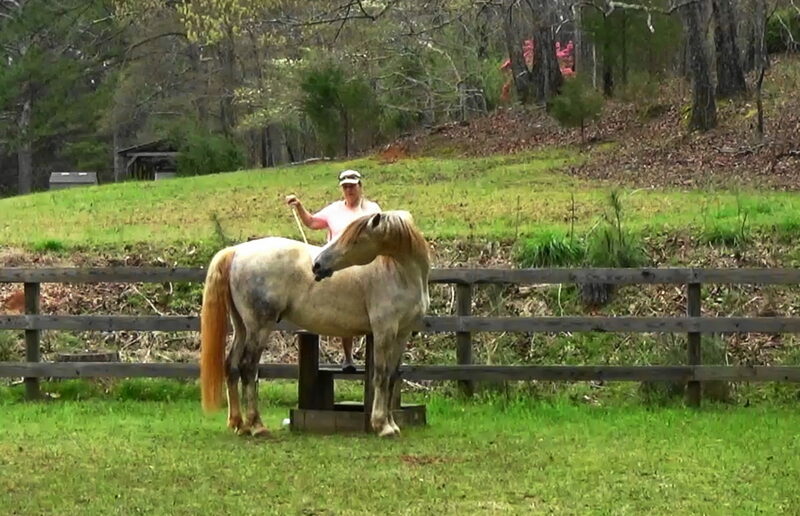 ‘Clicker Therapy’ could be used to teach a horse to control his body and emotions. ‘Clicker Therapy’ could be whatever we needed/wanted it to be. We were the artists, the creators of our journey. ‘Clicker Therapy’ supported our journey, inspiring us in autonomy and authenticity. ‘Clicker Therapy’ led us to new knowledge and awareness. New ways of observing and understanding the mental and theoretical concepts of what became our communication and language. ‘Clicker Therapy’ expanded our skill-set of technical knowledge and proficiency. ‘Clicker Therapy’ created artists in both of us as we learned new skills, techniques and discovered our innate abilities. ‘Clicker Therapy’ developed and improved our skills by combining our abilities and our new-found knowledge. 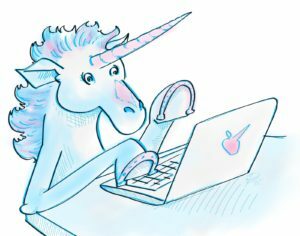 ‘Clicker Therapy’ led us to find our subtle and imaginative abilities of inventing, experimenting, devising, or executing our new techniques. ‘Clicker Therapy’ became our new ‘art’ of building trust, confidence, connection and creative power. With autonomy and at liberty – ‘Clicker Therapy’ began. 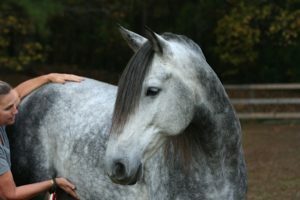 Every horse responds differently to their life experiences of building trust, bond, connection and communication. Each receives their life changes differently. Rhett had experienced many life changes in his short 7 years and the calloused, yet sharp, edge he had was palpable. 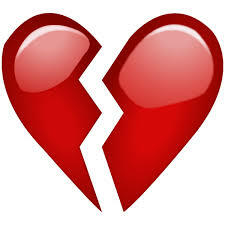 Rhett had suffered both ‘passive’ (early years) and ‘active abuse’ (later years). Passive abuse does not involve physical harm, rather it is characterized by neglect – lack of food, water, shelter or veterinary care. Active abuse involves physical harm, such as punishment by excessive use of a whip, and beatings. 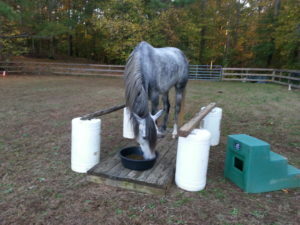 And because of this, Rhett’s trust was inhibited in the beginning, because of his ‘learned behaviors’, especially when things offered in autonomy and at liberty. We began to find our groove and routine. We allowed each interaction, no matter how seemingly small, to organically flow into a ‘learning session’. Which meant our therapy sessions were many! I knew alot about the use of the pressure/release system or ‘negative’ reinforcement. Don’t let the word ‘negative’ scare you, it simply means ‘to remove’ . Apply pressure, horse moves, remove pressure. Stage 1 – Unconscious Incompetence. I don’t even know I don’t know . Stage 2 – Conscious Incompetence. I know I don’t know. Stage 3 – Conscious Competence. I know I know but still requires thought and effort. 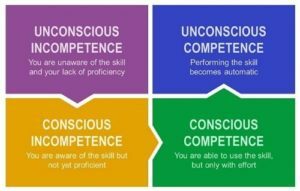 Stage 4 – Unconscious Competence. I know it so well, it’s second nature. Rhett was the MASTER of Stage 4 – Unconscious Competence of reactions for ‘learned behaviors’. His skills and techniques were legendary!! 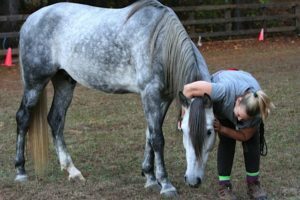 The characteristics of anger, fear, panic and anxiety were attached to nearly everything requested of Rhett, from simply stepping over or back out of my space, and him reacting with a threatening bite, to not kicking swiftly and violently when asked to pick up his hindfeet. He had so much practice with the skills of ‘defense’, that it truly had become “second nature” and was performed easily and certainly without his thinking. The making of mistakes was hard for someone who, herself, was a MASTER of Stage 4 – Unconscious Competence, in the use of negative reinforcement. I no longer thought at all about how to use the tools, it was ‘second nature’ to me. 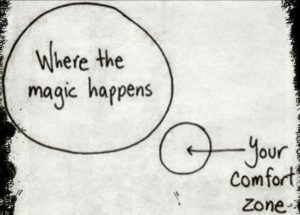 Ahhhhhh – the discomfort of being a learner. An adult learner. 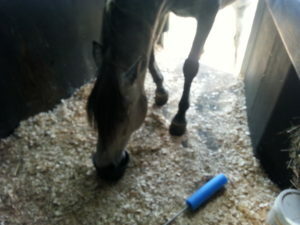 This was going to be more than a horsemanship journey. This was going to be a life-changing journey. Do you see your personal lesson(s) in this chapter of the story?